Built between 1874-7 and modelled on SS. Augustine & John on Thomas Street in Dublin, St Patrick’s has a fine spire floating over a large recessed arch enclosing the portal, arcades and a fine rose window. The arch expresses the inner volume of the church behind the spire. 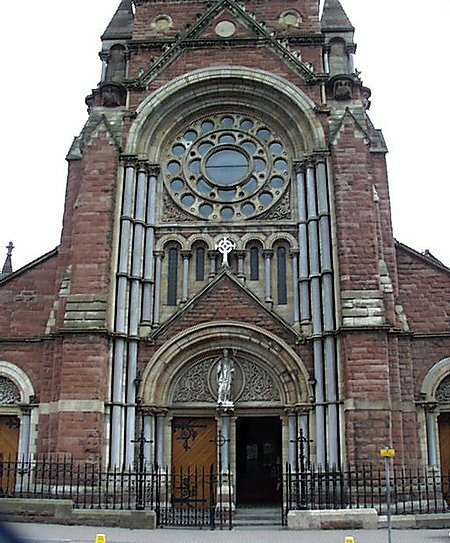 “The style of architecture adopted for the new Church of St. Patrick, Donegall-street, Belfast, is the Romanesque, the chief features of which are the prevalence of the semicircular arch, bold simple details, and strong massive construction. In plan the church will consist of nave, side-aisles, large transepts, sanctuary, side chapels, sacristies, &c. The nave will be 32 ft. 6 in. wide, and from inside of west wall to apse 125 ft. in length. Across the transepts the length will be 96 ft. by 45 ft. wide. In the transepts gallerie sare provided, but kept back from the line of aisles on either side, so that although accommodation for between 300 and 400 persons will be provided by means of these galleries, they are so designed as not to interfere in any way with the architectural effect of the church; and, although their occupants will have a full view of the sanctuary and side chapels on entering the church by the western doors, no indication of the existence of such galleries presents itself. The galleries will be approached by spacious staircases, each with its own external door entrance at the north and south transepts respectively. 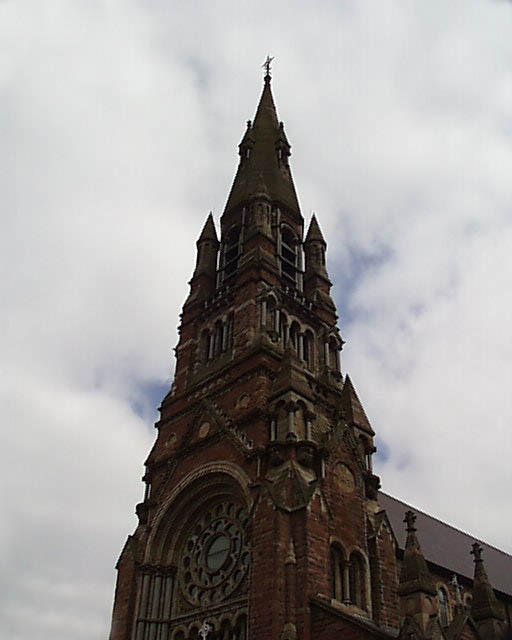 The nave is terminated at the west end, which forms the façade in Donegall-street, by a massive tower and spire rising to an altitude of 180 ft. The construction of the upper portion of the tower is very original and ingenious; for although, until it clears the nav roof, it is a parallelogram on plan—the full width of the nave across the front by half the depth—it is reduced to a perfect square over the roof without in any way disclosing, owing to its peculiar treatment, that such is really the case. The upper portion of the tower is designed for a peal of bells,and also possesses a chamber for one large bell up to about three tons in weight. The front wall of tower (which, under the peculiar arrangement of the design, forms the west wall of the nave) is pierced by a large double entrance doorway, enclosed by a deeply-moulded arch, within which, in the tympanum, will be a statue of St. Patrick, 7 ft. high. 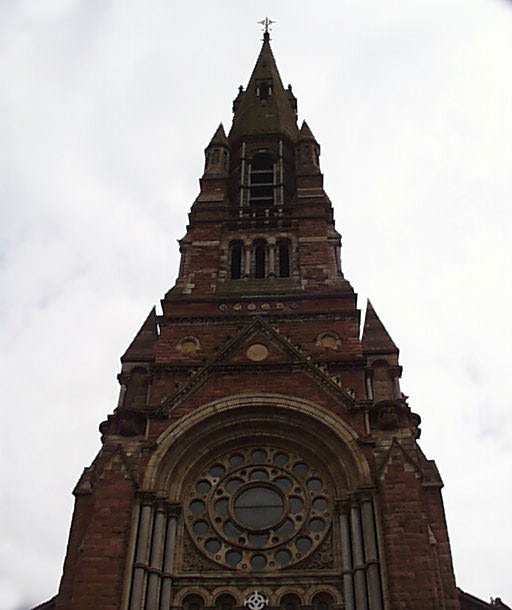 Over the great doorway will be a deeply-recessed rose window, contained within three orders of mouldings, supported by as many shafts of Dumfries stone, with carved capitals and the arch, which encloses the west window, and which, it may be added, imparts dignity and grace as well as a sense of solidity and massiveness to the design, the height is 43ft. ; and to the soffit of the inner order of mouldings over window, 52 ft. Within the tower, over the main entrance, and under the west window, will be the organ gallery, approached by a spiral stone staircase. The eastern end of the church presents the features of a semicircular apse, the full width of the nave, flanked at either side by side chapels. The sanctuary, consisting of the foregoing component parts, is separated from the nave and transepts by three stone arches—the centre one rising to a height of over 50 ft. from floor. The apse, or chancel proper, is lighted by seven lancet windows arranged round the circle; and when these windows are filled with figure subjects in stained glass,the effect will be very rich indeed. Rose or wheel windows light the side chapels, and the intention is that at a future date these, as well as the windows of the chancel, shall be filled with painted glass of a character to harmonise with the design of the church itself. The nave will be separated from the aisles by an arcade of six. lofty stone arches on each side, supported on columns of red Dumfries stone, with white stone capitals (carved) and bases. The height to the crown of arches will be 25 ft. from floor. Over these arches is a lofty clerestory, lighted by a continuous range of lancet windows—two to each bay or division —in the length of the nave. The roofs throughout will be constructed of worked and moulded principals, having a semicircular rib, and the spaces between them will be divided into panels, and sheeted with pitch pine polished sheeting, laid diagonally and following the curvature of the principals. This form of ceiling is not alone excellent for its graceful effect, but is particularly calculated to perfect, as far as possible, the acoustic properties of the church. To the centre of the ceiling from the floor line the height will be 53 ft. The confessionals are provided for within the thickness of the walls. The new church will be seated to accommodate over 2,000, allowing the ordinarily recognised superficial area for each person. The design (which was unanimously selected by the bishop and the committee) is by Mr. T. Hevey, F.R.I.A.I., in conjunction with Mr. M. H. Thompson, and the works will be carried out jointly by them. Messrs. Collen Bros., Portadown and Dublin, are the contractors.” The Irish Builder, January 1 1875.